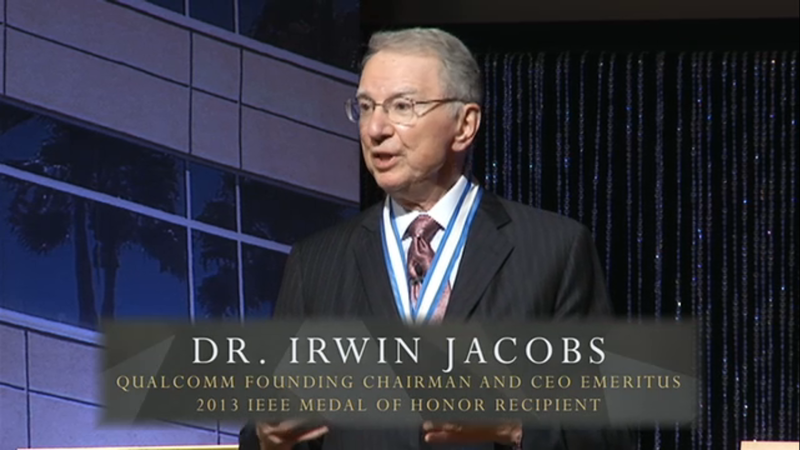 Not surprisingly, the 75 minute ceremony focused on his role in leading Qualcomm (and to a lesser degree Linkabit and his MIT days) to help lead the adoption of digital communications. I wasn’t invited to the in-person event, but watched the webcast. Here are my impressions. First, Jacobs seemed very spry and intellectually alert for a man of 79. I’d love to be that alert when I’m that age. Secondly, his son Paul seemed much more at ease standing in his father’s shadow than he did at the 2007 shareholder meeting (the first time I saw him preside since taking his dad’s job in 2005) or at the October 2009 joint interview with his father at CTIA in San Diego. Maybe Paul knows that everyone knows that dad’s not coming back. Or maybe he has some victories that gives him confidence. Or maybe he just got the CEO job too young, but has since grown into it. In any event, his praise of the founding CEO was sincere, heartfelt and convincing — the most moving of all the testimonials of the afternoon. Third, it appears that the video clips quoted most of the Qualcomm founders: Dee Coffman, Harvey White, Franklin Antonio, Chuck Wheatley. Klein Gilhousen was mentioned (in the context of the original CDMA prototype) but didn’t seem to have a speaking role. 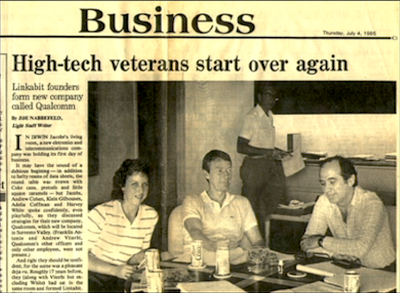 However, conspicuous by his absence was Andrew J. Viterbi — the only other Linkabit founder who was a Qualcomm founder. That would be the same Andy Viterbi who won the same medal three years ago. He showed up in a lot of pictures, but did not have a speaking or live role in the ceremony. (He did show up at the 2011 Marconi ceremony honoring Jacobs and the late Jack Keil Wolf). Instead of Viterbi, in the front row of the auditorium was the 2011 winner of the IEEE Medal of Honor, Morris Chang, founder and CEO of TSMC — who remains Qualcomm’s major manufacturing partner. From his public acknowledgement of Chang and their role in Qualcomm’s ongoing success, I got the sense that Paul feels he badly needs Chang and vice versa. I have heard that there has been an estrangement between Viterbi and Jacobs, although I’ve not asked either man about it directly. In some ways it reminds me of some of the superstar rock bands that broke up. As with the rock bands, I hope there will be one last smiling reunion for induction of the Qualcomm (or Linkabit) founders into the Hall of Fame.